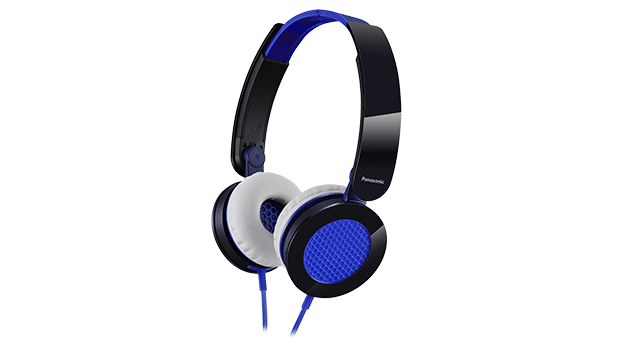 I recently had the opportunity to try out the RP-HXS200 headphones by Panasonic. These are budget headphones (retailing for around £18 on Amazon), something immediately evident from the rather basic clamshell packaging which claims “Clear & powerful sound”. The set I tried were a funky black, blue and light grey combination and I must admit, I did like the look of them. Once you get them out of the packaging and in hand, they do feel very plasticky and I’m not sure how much daily abuse they’ll take, although I was pleasantly surprised to see the flat, tangle-free type cables do seem reassuringly robust. A rarity at this end of the market. One of the main gripes I have with on-ear headphones has always been a question of where you put them when they aren’t in use. I am nowhere near hipster enough to dander around with them around my neck like a big plastic fashion accessory and they are usually too big or fragile to be just chucked in a bag. The Panasonic party piece is that they fold up Transformer style into a neat little form factor that can be easily tucked into a bag or jacket pocket. This is a great feature, but sadly these headphones are not the clunky, rugged Transformers of old, they are the flimsy plastic modern ones and I was more than a little wary of putting too much strain on the various joints, hinges, and rotating pieces. Once they were transformed and ready to roll out, I plugged them into my iPhone to see what kind of sound they were capable of. To be honest, I wasn’t expecting much, but I was actually rather impressed. For under £20, the sound quality was really rather good. Well, initially it was. The Panasonics seem to handle intros and simple pieces very well indeed, punching well above their weight. I was listening to S.O.B. by Nathaniel Rateliff and was getting some great separation and a nice tone during the opening of the song. The acapella vocals, humming and clapping were all coming through extremely well. Sadly this ended swiftly when the rest of the band kicked in and price point of the Panasonics showed through. Unable to handle all the layers and detailing, the sound appeared compressed as they struggled to funnel the high, mid and bass levels through the drivers. I tried several pieces across a number of musical genres and found this to be consistent. They did very well with the stripped back sounds of Lorde, but sounded terrible with Metallica’s layered detail and depth. I initially spent about 25-30mins testing out these headphones before I had to take them off. The plastic covering of the earpieces had slowly roasted my ears almost to the point of combustion and I had to take a break. 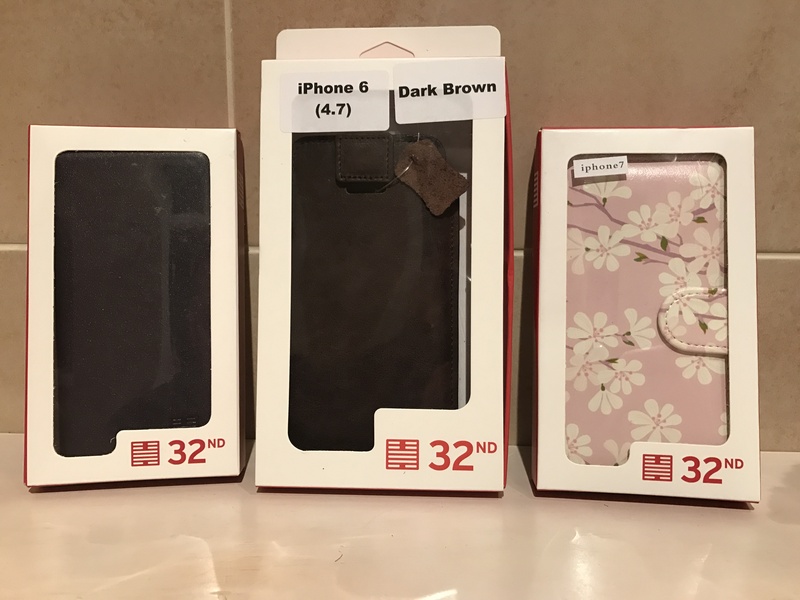 The Panasonics are very light and have a great range of adjustment and I suspect if you are the sort that can put up with the plastic against your skin for extended periods of time, you’ll probably have no trouble with them. But if you are the sort that finds headphones make your ears start to get warm after a while, I’d maybe pass on these. In truth, I personally have never found on ear headphones particularly comfortable and these are certainly no exception, but your mileage may vary. Overall I’d say these headphones are aimed at the younger user and at the price point there is always going to be a compromise with the quality of sound and construction. If you like on ear headphones and simple pop music, then they are a pretty good buy and certainly worthy of consideration. For those looking for a quality sound however, I would suggest leaving these for the kid in the skinny jeans and slouch hat behind you. The Panasonic RP-HXS200’s are available at www.reichelt.co.uk the online electronics retailer where many products up to 20% cheaper than elsewhere in the UK. Never in the history of everything have we been more reliant, more dependent on electronic devices. Separation anxiety caused by being without your mobile phone is now a recognised stress condition! So, you left the house this morning, but you forgot to charge your phone – how will you ever know what your Instagram friends had for lunch or what the latest viral cat video is? 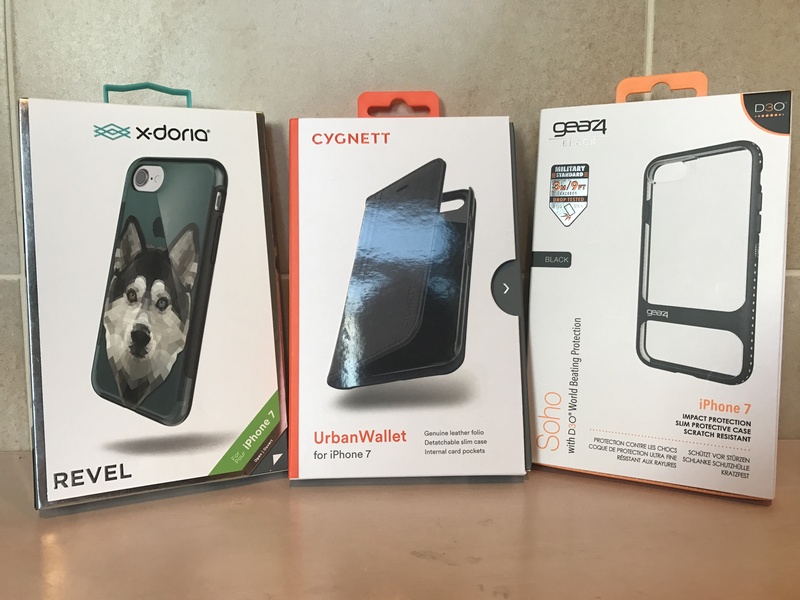 You need a mobile power pack! Thankfully there are roughly a bazillion models available in every imaginable shape, size and capacity. But what happens if you run up mountains for fun, or a much more likely situation; you find yourself miles from home during the inevitable zombie apocalypse? Then you need the Griffin “Survivor” Power Bank. The secrets in the name folks! Griffin touts this as the Chuck Norris of battery packs due to its super rugged features. It’s drop proof from a height of 2m (we’ll see about that), as well as being water, dust and zombie blood resistant thanks to being fully encased in a textured rubber exterior and port cover. The corners have a good bit of give in them to cushion impacts, so it’ll be useless as a bludgeon, but at least you’ll always be able to upload those skillful headshot videos for “Zombie kill of the week” contention. On closer inspection, I noticed that the rubber isn’t actually bonded to the unit, but more like a form fitting case. Where the opening is for the ports, the rubber can easily be pulled away from the unit, so water could get in and get trapped in there. The port cover does fit snugly, but as pointed out in the unboxing video, the lifting tab does make it easily removable and I imagine it could be easily snagged, although, after a fortnight of bouncing around in the bottom of my bag, this only happened once. Mercifully I was not wading through a swamp or anything at the time and my office has only the usual type of pre-coffee zombies. I did try the drop test 3 times from around the 6-foot mark and the Survivor did indeed survive with only minor scuffing to the rubber housing. 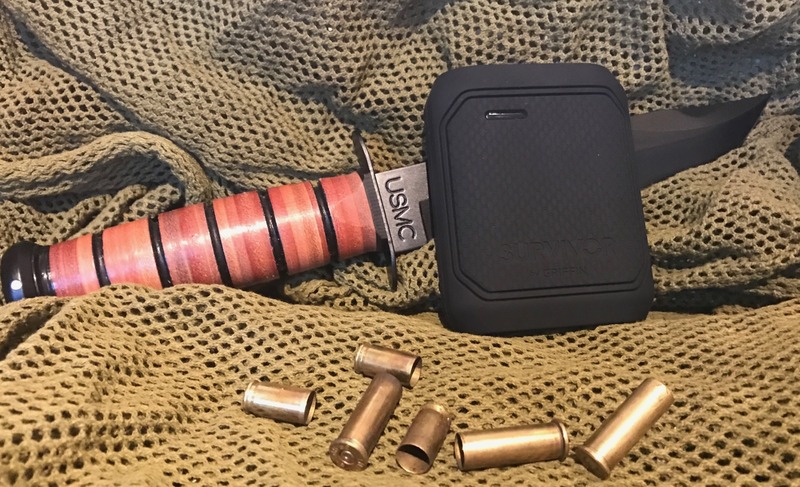 Really the only area of potential wear and tear vulnerability I see is the port cover and its little rubber retention piece. 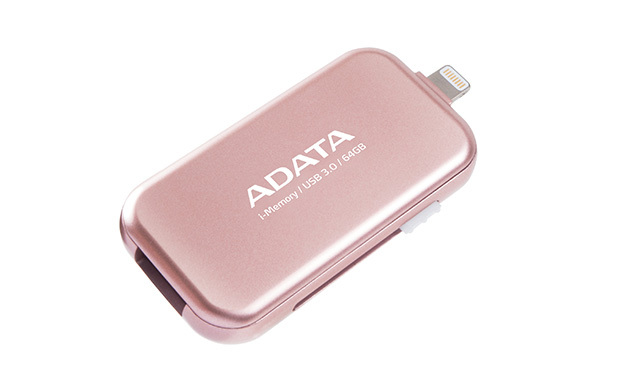 The 10,050mAh Griffin is obviously larger than its peers because of the additional layers of protection, but it is still easily portable at 265g and the ability to just throw it into a bag and forget about it is a big bonus. 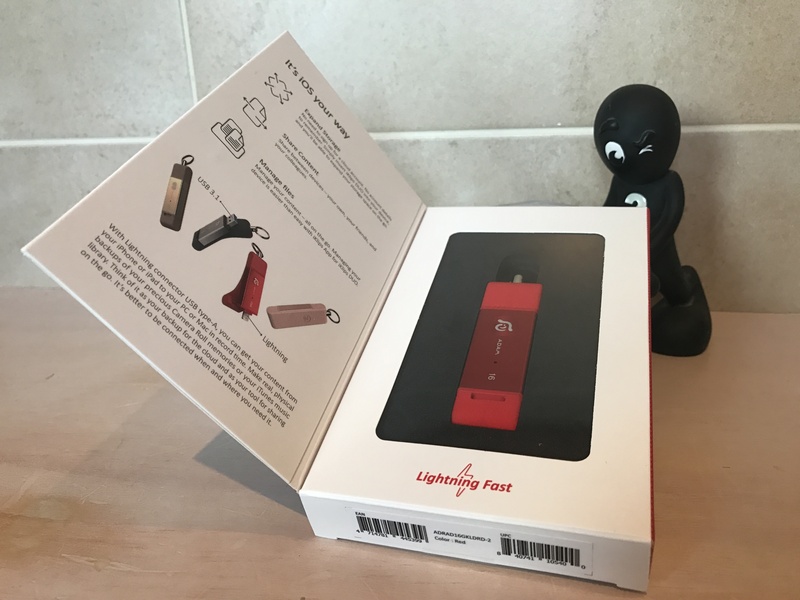 Griffin makes several claims on the packaging – 2 hour charge time, 5 phone charges etc. In my (zombie-free) testing, I found that when using standard USB ports on my work PC or an iPhone plug, the charging took a lot longer. You’ll need to up the power supply if you want to get anywhere close to the 2-hour claim. Charging a two-year-old 1,810mAh iPhone 6 with a bog standard apple cable took around 90mins to get it from 15% to full, which was a little underwhelming. This is definitely a workhorse rather than a thoroughbred. I managed to get 4 full charges and it ran out of juice at 60% on the 5th. Depending on the size of your phone, your mileage may vary. It has the, now obligatory, tiny LED light for illuminating the 2 feet directly in front of you. These lights have become standard on battery packs now and are handy for when you are digging through a bag at night trying to find something, but really, little else. 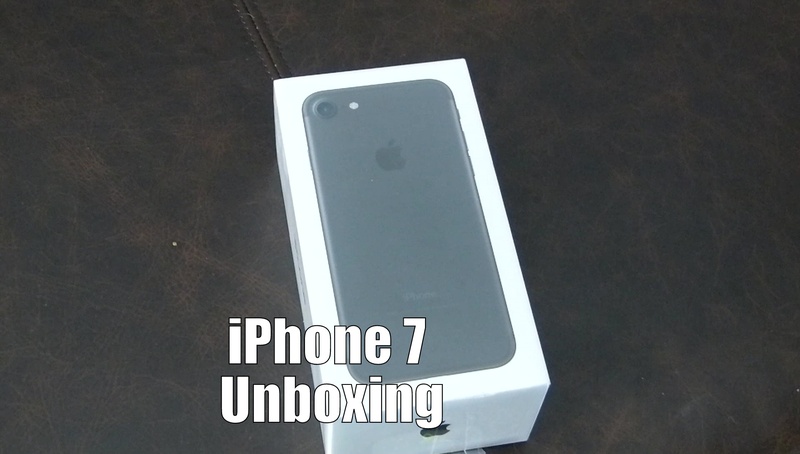 Compared to its rivals, the performance is distinctly average. The equivalent capacity Anker will charge your device noticeably quicker and cost a heck of a lot less at £15. The Survivor is priced at £56 although it can be found for £47.50 on Amazon (mainland delivery only – sorry Northern Ireland) but it’s somewhat hard to justify such a massive price difference just for the additional ruggedisation. But, and it’s a big but – the Griffin comes with a lifetime warranty! A modern electronic device, one that is designed to take some abuse and it comes with a lifetime warranty!! Unheard of!!! From their site, Griffin state that if you can provide proof of purchase and are the original purchaser, they “will repair or replace the product if due to defective parts or workmanship; it does not perform as specified.” It does not cover “misuse” however. But rubber can perish and batteries will die, so it’s a bold, yet confidence inducing guarantee by Griffin and I suppose this has to be factored into the price. Unless of course, Griffin means the lifetime of the owner and they know something we don’t………which brings us back to zombies……. Sennheiser have long been one of my “go to” brands, particularly their CX range of in-ear headphones. 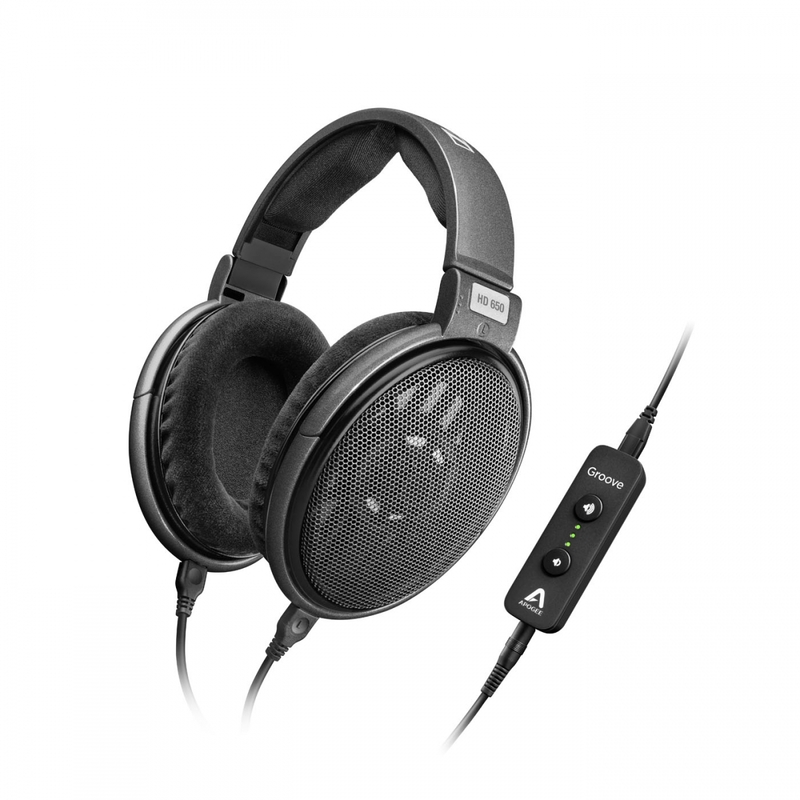 They represent a nice balance of sound quality and reasonable pricing. I was excited to try out these “audiophile” level HD650 headphones and more than a little intrigued with the bundled in line amp by Apogee. Initial impressions were positive, if a little underwhelming. The headphones feel solid and robust, although at this price point I wasn’t expecting quite so much plastic. They feel very functional rather than luxurious, their appearance doesn’t exactly give away their high-end pedigree. I decided to try out the headphones first and figure out the amp later. I’m used to in-ear headphones, so these felt a little odd to me initially. They completely encompass your ears rather than sitting on them and despite a surprisingly firm clamping force, are actually rather comfortable. This is thanks to the velvety soft fabric cover on the foam earpieces. This is much more comfortable than plastic or leather but also likely to get grubby quicker. It would be interesting to see how this soft fabric stands up to wear and tear over time. They are fairly light for their size so I didn’t have that feeling that you were wearing saddle bags on your head. 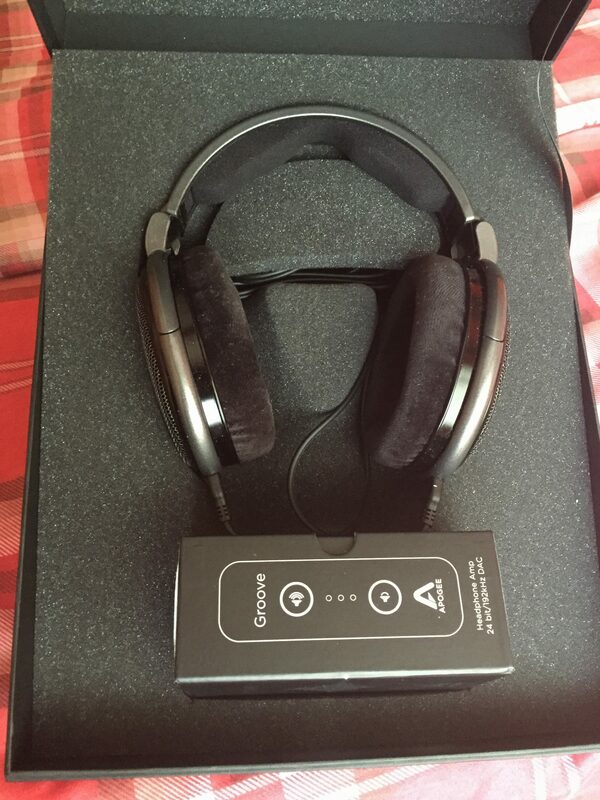 I did notice that the open backed design did not offer much noise cancellation. Although muffled, surrounding noise is definitely still audible, so listening to them on the bus or train probably won’t work. There is plenty of adjustment in the size of the headband, even for someone with a melon the size of mine, but I did note that there wasn’t a lot of spring in it. The earpieces themselves pivot a little, but everything is quite rigid. I plugged them HD650’s into my iPhone since it’s what I listen to music on most often and I was keen to see if the phone (and therefore ipod touch) could deliver enough power to drive these 300Ω beasts. The short answer is yes, very well in fact! Granted you have to crank the volume to levels you wouldn’t dream of with other headphones, but the sound reproduction is jaw dropping. I must pause here to mention one other thing I noticed, or rather my wife did. The open backed design that did little to keep the outside world out also does little to keep the sound in. The music I was enjoying was clearly audible to her, although she apparently wasn’t enjoying the experience quite as much as I was. Again, buses and trains are probably a no-no. Final point to note on the open back design is that it doesn’t heat your ears up to melting point quite so badly, so thumbs way up from me on that particular bugbear. It’s difficult to convey just how good these headphones sound; they have a nice neutral sound that somehow manages not to sound flat. They excel at the high and mid ranges and acoustic music sounds particularly well reproduced. You are able to pick out incredible detail and the sound separation is outstanding. The bass tones are gloriously unembellished. Unlike many headphones that try to give you concussion by turning the bass line into something akin to a jackhammer, the HD650s have a beautifully round bass, capable of absorbing the deepest rumbles without rattling or buzzing. No matter what track I tried, I could not get them to bottom out and distort. Again the sound reproduction seems incredibly realistic and once you get used to not being assaulted by an over-amplified bass thump, the listening experience is simply wonderful. I love the option of being able to replace the cables from the headphones. My biggest gripe with the Sennheiser CX range is that they have very thin and flimsy wires that never seem to last past 6 months use. 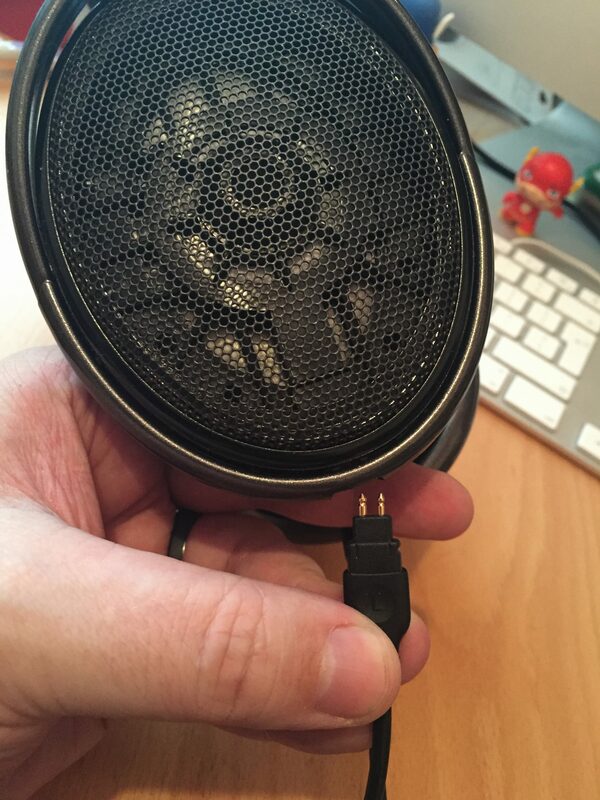 With the HD650s, you are able to remove the short cable at the earpieces (it’s connected on both sides unlike some other headphones) and replace it with a 3m long cable terminating with a full sized jack. Adding a full to mini jack adapter, I was able to plug these beauties into my record player and sit back and relax. This was an outstanding experience, listening to uncompressed music on a basic, manual record player and high-end headphones. I lost an entire weekend this way. I’m not much of a gamer, but I did try them on my Xbox and they did not disappoint. The soundscape seems massive and again, the fantastic sound separation really comes out trumps here. Then it came time to try the amp. I’ve never used one before so I was a little dubious about it. The headphones sound great, do I need an amp? Especially when they cost as much as the headphones themselves!! How do I even use it? 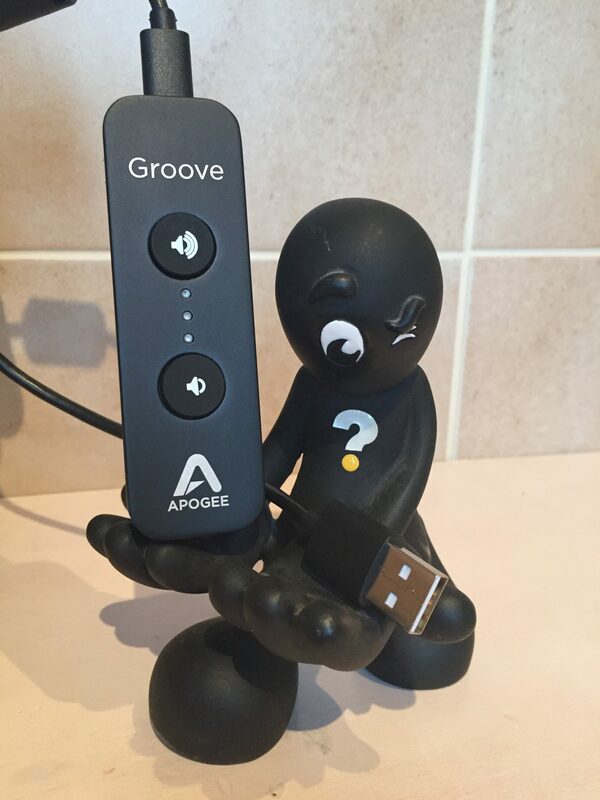 The Apogee Groove amp is a simple, unassuming little device with nothing but volume controls and 3 small LEDs on the exterior. It’s powered via a USB port so it’s designed to listen to music from a computer. This confirms my theory that the best use of these headphones is in a studio type situation where accurate reproduction of the recorded sound is crucial. It’s not how I usually listen to music myself, but I was so far down the rabbit hole with this setup that I just had to know what it would produce. Playing through a Mac is a simple procedure of plugging it in, changing the sound settings and off you go. The PC is a slightly different affair. You must install the appropriate driver – one that you can only get directly from Apogee, and only after you have registered the product. Why this is is anyone’s guess, but it’s quick and painless. Pick your track and off you go. Disclaimer: you may wish to have a buddy present to help you pick your jaw up off the floor. The combination of Groove and HD650 synergises into a listening experience unlike anything I have ever heard. Every aspect is significantly enhanced – the detail, the separation, the clarity, instantly become richer, deeper and wider! I found myself trawling through my music library listening to endless numbers of tracks. Tracks I have heard a thousand times and yet I was able to pick up sounds and layers that I have never heard before. I had my doubts about the necessity of an amp and to be honest, yes, you could no doubt get by quite happily without it. However the sound produced by both devices working in conjunction is just unreal. Closing your eyes, you can almost picture yourself in the recording studio with the band arranged around you. Necessary no, desirable, oh hell yes! Out of interest, I tried the Groove with my Klipsch R6 in ear headphones and again, this tiny little box transformed what are already excellent sounding headphones. It basically takes the strengths of the any headphones plugged into it and expands on them. This bundle is exclusive to Sennheiser on their website for a not inconsiderable £490. A bit of research showed that the cost is split roughly 50/50 between the two devices and I did wonder if the increase in sound quality could possibly warrant such a splash out, especially when the combo can only be used when listening to music on a computer. For your average man on the street – probably not. But then this is the audiophile world. If you are happy to spend £250 on headphones (which your average man on the street certainly won’t), forking out an extra £250 for a more perfect sound experience appears a much more reasonable proposition. Certainly for professional use, in a studio environment for example, it’s a no brainer, just buy one. It’s worth mentioning that if you aren’t concerned about getting the headphones and amp in the one (admittedly rather swish) box, you can save around £40 by sourcing and buying them separately. The HD650s are available through Amazon for around £230. I don’t know if Apogee developed the Groove specifically for use with the HD650 or it’s just a deal done between the companies, but the two devices complement each other exceptionally and seem to really bring out the best in each other. If you are in the market, I would happily recommend them if you have the pennies. These have now become the bar that all others will be judged against.